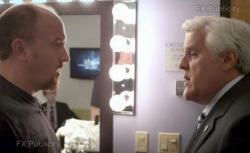 Louie Season 3 recaps: Louie and the Letterman show. I hope Louie takes the job. I hope Louie takes the job, because I’d love to see C.K.’s take on what an alternate-reality Late Show would look like. I have in mind Zach Galifianakis’ marvelous but short-lived real-life talk show, Late World (here’s a beardless Galifianakis meta-interviewing Alias-era Bradley Cooper back in 2002, going for broke in the knowledge that the show had been canceled.) Could a Louie late-night show be any less convention-bustingly brilliant? I also hope he takes it because of what Allison identifies as the “disconnect between working-Louie and life-Louie,” and because of what New York’s Ben Williams said on Twitter about being “tired,” this season, of “loser Louie.” I don’t agree without some qualification: In comedy, flawed, weak characters are as a general rule funnier than strong, put-together ones, and I like that T.V. Louie doesn’t have it going on, career-wise, the way real-life C.K. does. But I do agree that there is a night-and-day difference this season between Louie on stage—sharp-witted, observationally gifted verbal assassin—and Louie trodding through the city streets, cowed, inarticulate, or outright mute in his interactions. As I wrote a few weeks back, one of the many moments that made the “Daddy’s Girlfriend” two-parter great was Louie’s monologue when he asked out Liz in the bookstore—finally, we got to see some of the verbal flair from his stand-up bits on display in a scene, the way it had been with much more regularity in past seasons: Negotiating his problems with Dane Cook, scolding his daughter for being bored despite having seen “none percent” of the world, emptying his heart to Pamela at the flea market, etc. Onscreen-Louie may not have it all figured out, but the guy knows how to put together a sentence and drop some unlikely, horizon-expanding wisdom. This season, though, perhaps in the emotionally ruinous wake of Pamela’s departure, we’ve seen much less of that guy. I want Louie to take Garry Marshall’s call to arms seriously, then, because, even if he doesn’t beat out Seinfeld for the job (and who’s expecting him to?) it would be fascinating television to watch him try and make some fascinating television.